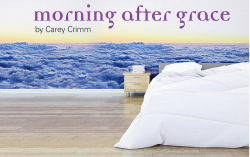 Shakespeare and Company is starting its 41st season with the New England premiere of Morning After Grace by Carey Crim. Talking with the cast and the director a week before the play opens on May 24 was enlightening. As the actors shared their understanding of the people they play, we became eager to see the play. Reggie LIfe, the director, also shared his insights about the production. We have enjoyed Corinna May’s work in a variety of plays over the years at Shakespeare and Company. However, Steve Barkhimer and Kevin Vavasseur were new to us. Their approach to this contemporary comedy increased our interest in seeing this team of actors working together. Their shared insights promise a delightful evening in the theatre with added understanding of some of life’s transitions. The watch this brief video of the director. After that, click below to order tickets.